The facility uses state-of-the-art methods for canine rehabilitation. Each case is individually evaluated. Four primary focus areas are strengthening, endurance, proprioreception and range of motion. Programs are developed using aquatic therapy, exercise therapy, gait training and passive rehabilitation. We teach active range-of-motion, strengthening, endurance and proprioreceptive exercises. The center offers exercise equipment such as balance boards, physioballs, physiorolls and cavaletti poles. 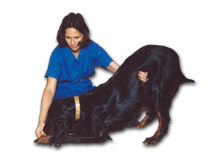 In addition, we can develop a customized home exercise program to enhance your dog's recovery. After surgery some dogs need help to use a leg that has given them problems for some time. Early gait training begins with initial weight bearing and balance. Advanced gait training increases stride length, range of motion, and symmetry. The canine underwater treadmill dramatically speeds recovery from orthopedic and neurologic surgery. The therapeutic effects of water are combined with exercise to provide a safe and comfortable workout. The resistance of the water and the reduction of weight bearing allows for a more pain-free exercise on arthritic or traumatized joints. Speed, water level, and water temperature can be adjusted to suit the dog’s individual needs. The low impact work is also perfect for beginning a weight loss program. We monitor range-of-motion and body composition very closely throughout the rehabilitation process. 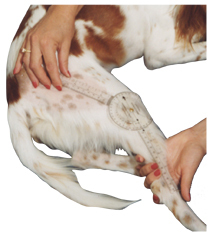 Gait analysis provides valuable information about the dog's movement. 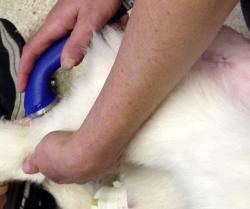 Therapeutic ultrasound stimulates blood flow to increase tissue temperature and remodel scar tissue. This promotes healing, and reduces pain and stiffness. 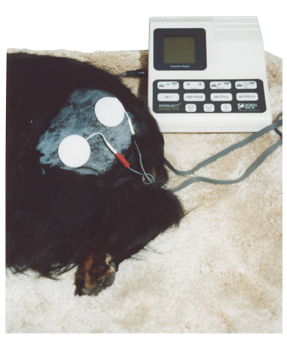 Electrical Muscle Stimulation (EMS) provides neuromuscular re-education following neurologic trauma, attenuates muscle atrophy and provides pain management.